Fireworks weren’t the only things flying above the Hudson River for the Fourth of July yesterday. For the first time since 1986, three blimps competed in the Independence Airship Invitational race to see who was superior in the skies. After an hour and a half of airborne competition, Horizon Blue Cross Blue Shield beat out Hangar 1 Vodka and DirecTV for bragging rights. 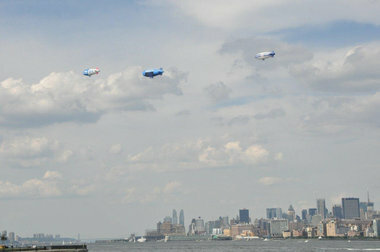 RICHARD J. McCORMACK PHOTOTHE SKYWAY: Blimps race over the Hudson. The race started at 5 p.m. at Liberty State Park in Jersey City. The blimps raced along the Hudson River, reaching 25 miles per hour, according to a representative from Horizon Blue Cross Blue Shield. Horizon Blue Cross Blue Shield was the first to reach the finish line, followed by Hangar 1 Vodka with DirecTV in the rear. With 20 existing blimps in the world, the race represented a rare sight for blimp enthusiasts like Jim Bernan from Jersey City. Four blimps competed in the last race in 1986 during the 100th anniversary of the Statue of Liberty and her restoration. The Fuji blimp won top honors that year, and held onto bragging rights until yesterday.